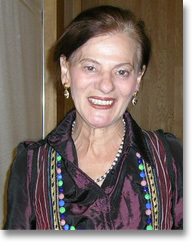 Lila Cona (aka Ljiljana Nikolova Petrović) was born in Dorošani, an Arumonian and Turkish speaking village near Štip, in the Federal Republic of Macedonia (formerly part of Yugoslavia). She first learned Macedonian at primary school. A graduate of the Department of Romance Languages at the Philological Faculty in Skopje, where she specialised in French, she has recently compiled a groundbreaking anthology of contemporary Arumonian poetry from all over Europe, which is to be published in Arumonian, Macedonian and French by PEN Skopje, 2010-11. She is currently preparing a textbook and grammar of the Arumonian language; and also awaiting publication is her recently completed Serbian translation of Nicholas Trifon’s 60 page study, Les Aroumains, Un peuple qui s'en va (Cincari, narod koji nestaje). Books she has translated into Serbian include works by the Arumon poet Vanghio Dzege, by the Macedonian poet Mateja Matevski and, from French, fiction by Simone de Beauvoir (1996) and Christiane Rochefort (1999). Lila Cona speaks Italian, Spanish and English, as well as Serbian, Macedonian and Bulgarian. Since 1975, she has lived in Belgrade, where she is married, with one daughter. Arumonian, also known as Aromanian, Vlach and Wallachian, is a Balkan language with an estimated maximum of 300,000 current speakers in parts of Greece, the Republic of Macedonia, Bulgaria, Serbia, Croatia, Kosovo and Albania. It is distinct from but similar to Romanian, and has several geographical branches, including: Macedo-Romanian, Megleno-Rumanian and Istro-Romanian. The Arumonians were traditionally a transhumant people, whose culture and traditions, until very recently, were transmitted orally.